Amaranth loves to grow in areas where any decent self respecting weed would never go. Also known as pigweed in some areas of the United States, you can find amarant in abandoned lots, waste areas and along roadsides across North America. Introduced, it is a annual herb with a stout up-right stem and alternating leaves. The leaves are broadest near the base and one to two inches long. The flowers form on densely crowded spikes and the fruits are tiny and incased in short, flexible brackets. 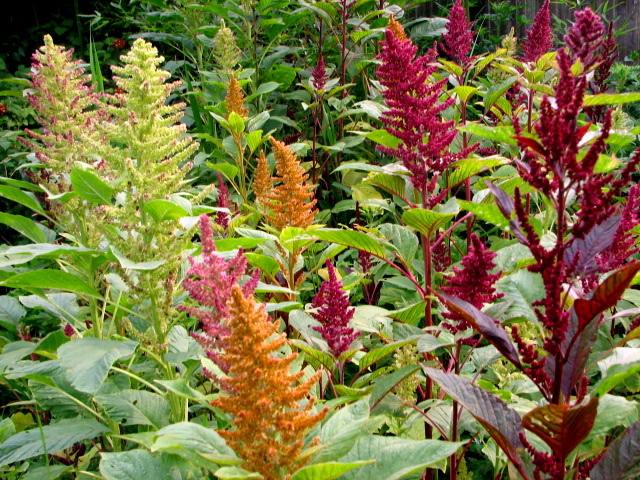 Several species of Amaranthus are edible but pigweed is a well known concentrator of nitrates and plants from nitrate-fertilized areas should be eaten in moderation. Collect young leaves for greens when plant is a few inches tall and before stem becomes woody. Boil for 10-20 minutes until tender and serve with butter and seasonings. Add other early spring herbs such as dandelion and chicory greens to add more flavor. Add vinegar, sliced boiled egg and bacon or shredded cheese. Fresh leaves make wonderful fresh salads and dried leaves are great added to soups in the winter. The seeds are edible either whole or ground into a meal or flour. Use as a flour substitute in any baking recipe. Pick seed clusters as the plants mature but before the seeds begin to fall. Dry completely and thresh by shaking into a brown paper bag and winnow on a screen or shallow bowl in a light breeze. Go here and here for more information on Amaranth as an alternative field crop. Sauté cumin seeds, chopped green chilies, and onion in a small amount of cooking oil. Add tomatoes and pigweed and saute for two-five minutes . Cover simmer for five minutes on low heat. Wash the rice and add to mixture. Add remaining ingredients and bring to boil. Reduce heat, cover and cook for ten minutes or until rice is tender on low heat. Combine all dry ingredients in a medium bowl. Add liquid ingredients and stir untilcompletely mixed. Spoon into muffin tins and bake at 375 degrees for 15-20 minutes. consistency. You can form this into balls and roll the balls in the whole amaranth seeds. This is a very tasty trail snack. Works best with the white amaranth seeds. recipe for Lamb’s Quarters rolls. These are super easy to make. Wrap 12 sheets filo pastry in a damp towel. The towel will keep them from drying out during the preparation, and make the sheets easier to work with. Work with 2 sheets of filo at a time. Brush one sheet of filo with olive oil. Lay another sheet on top. Cut in half legnthwise. baking sheet, seam side down. Repeat with other half of filo. Repeat with the rest of the filo sheets and the greens mixture. Bake at 375 F/ 190 C for approx. 20 minutes until golden. Let cool. Slice crosswise to make bite sized appetizers. Makes approx. 12 rolls/24 bite sized. brendanolen • This entry was posted in Recipe, Weeds and tagged amaranth, grain, weeds. Bookmark the permalink.